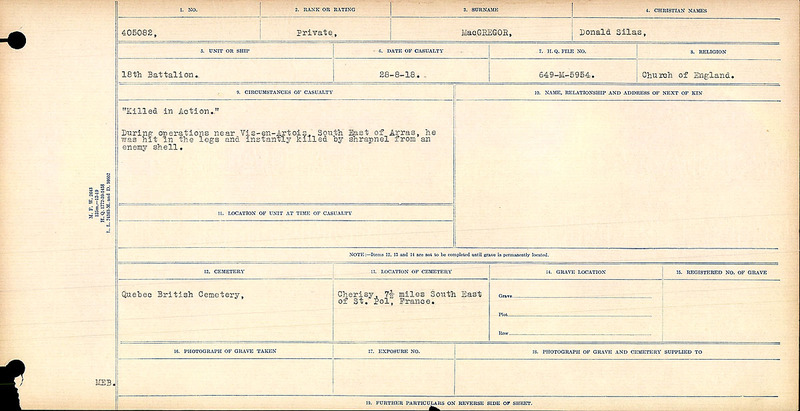 Source: During search of Circumstances of Death Register card for Sergeant James MacDougall. Pte. 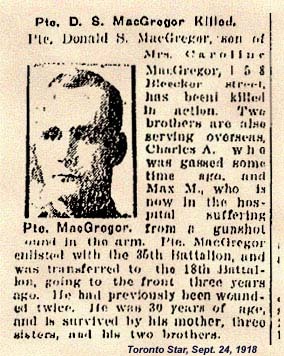 Donald S. MacGregor, son of Mrs. Caroline MacGregor, 158 Bleecker street, has been killed in action. Town brothers are also serving overseas. Charles A. [reg. no. 159138] who was gassed some time ago, and Max M. [reg. no 159138], who is now in the hospital suffering from a gunshot would in the arm. Pte. 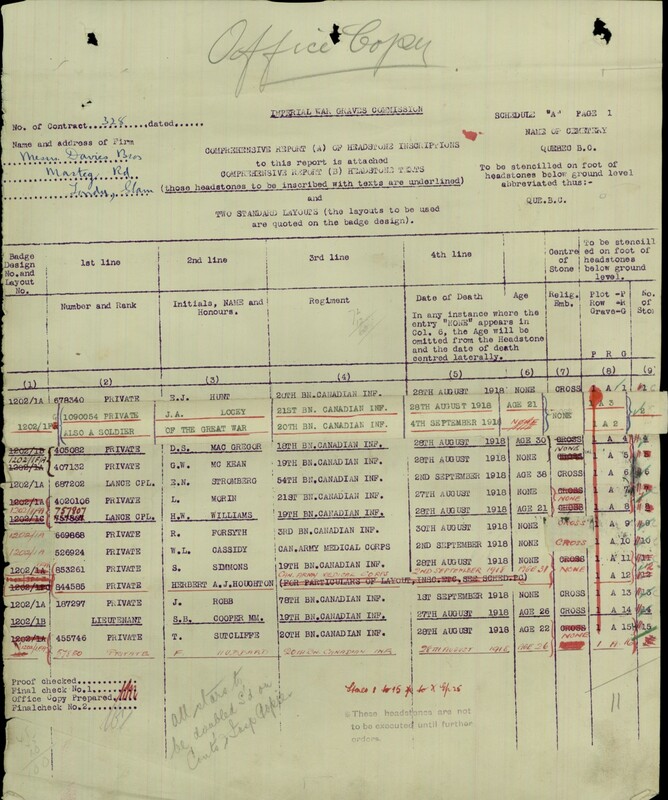 MacCregor enlisted in the 35th Battalion, and was transferred to the 18th Battalion, going to the front three years ago. He had previously been wounded twice. He was 30 years of age, and is survived by his mother, three sisters, and two brothers. During operations near Vis-en-Artois, South East of Arras, he was hit in the legs and instantly killed by shrapnel from an enemy shell. He is buried in the Quebec Cemetery. Grave reference A-4. • He registered for military service in WWI on 8 Jun 1915 in Niagara Falls, Welland, Ontario, Canada. According to the enlistment record, he was 5 feet 10 inches tall with a medium complexion, blue eyes, dark brown hair and a 30-inch chest. He also had a horses head tattoo on his right arm. 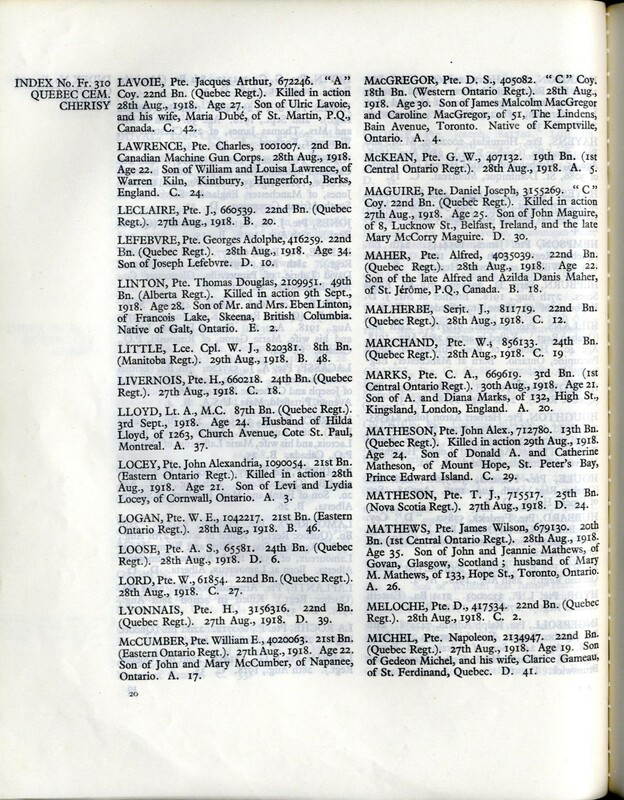 1 “Ontario Marriage Records 1801-1928,” database(accessed 13 Sep 2012), Donald MacGregor and Margaret Greig; York 1912. 2 Canada Donald Silas MacGregor; digital images, Canada, CEF Declaration Papers, 1914-1918 (accessed 4 Nov 2011). 4 One World Tree, http://trees.ancestry.ca/owt/person.aspx?pid=101429884. 5 1901 census of Canada, Ontario, district 82, sub-district 6, Kemptville, p. 7 and 8, dwelling 84, family 87; RG 31; digital images, Ancestry, Census – Canada – 1901 – Ontario . 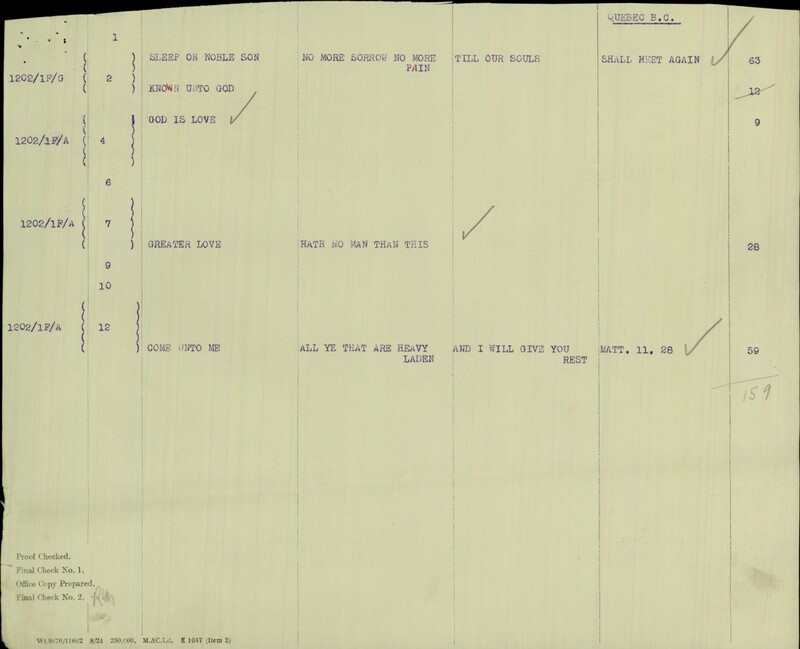 6 Canada, “William John Passmore,” Donald Silas MacGregor; digital images, Ancestry, Canada, CEF Burial Registers, First World War, 1914-1919 (accessed 4 Nov 2011). 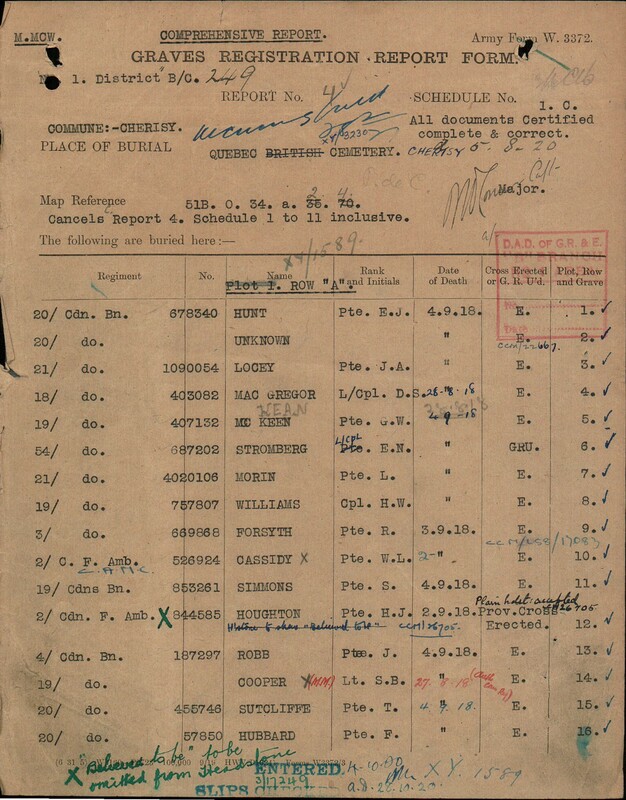 7 Canada, “William John Passmore death,” Donald Silas MacGregor; digital images, Ancestry, Canada, CEF Commonwealth War Graves Registers, 1914-1919 (accessed 24 Apr 2013). 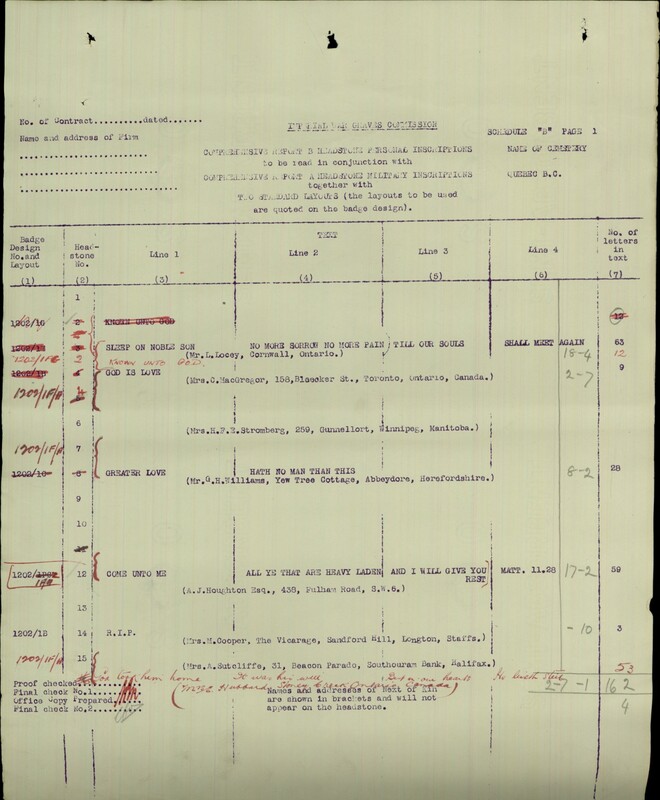 8 “Census of Canada – 1891,” database, Census – Canada – 1891 , James MacGregor and family; Kemptville, Leeds and Grenville North, Ontario, roll T-6349, Family No: 113. 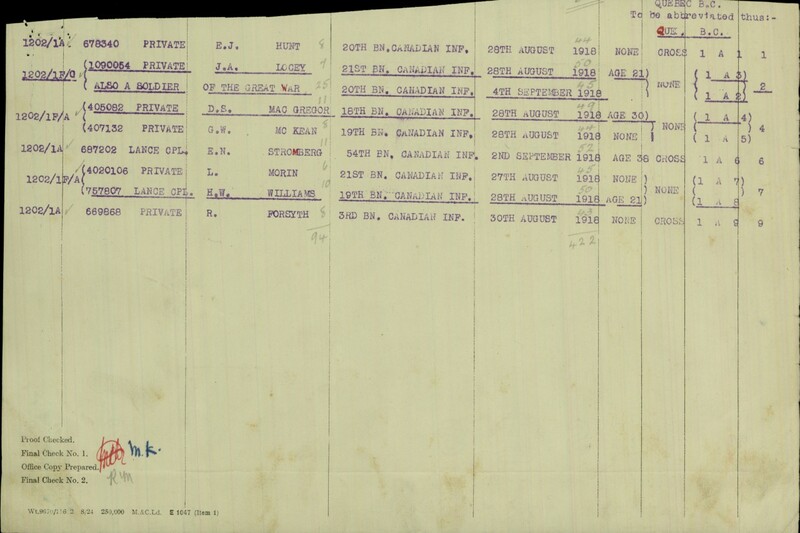 9 1911 census of Canada, Ontario, district 125, sub-district 15, Toronto, p. 22, dwelling 226, family 247; RG 31; digital images, Ancestry, Census – Canada – 1911 – Ontario . “Killed in Action.” During operations near Vis-en-Artois, Southeast of Arras, he was hit in the legs by an enemy shell and instantly killed.